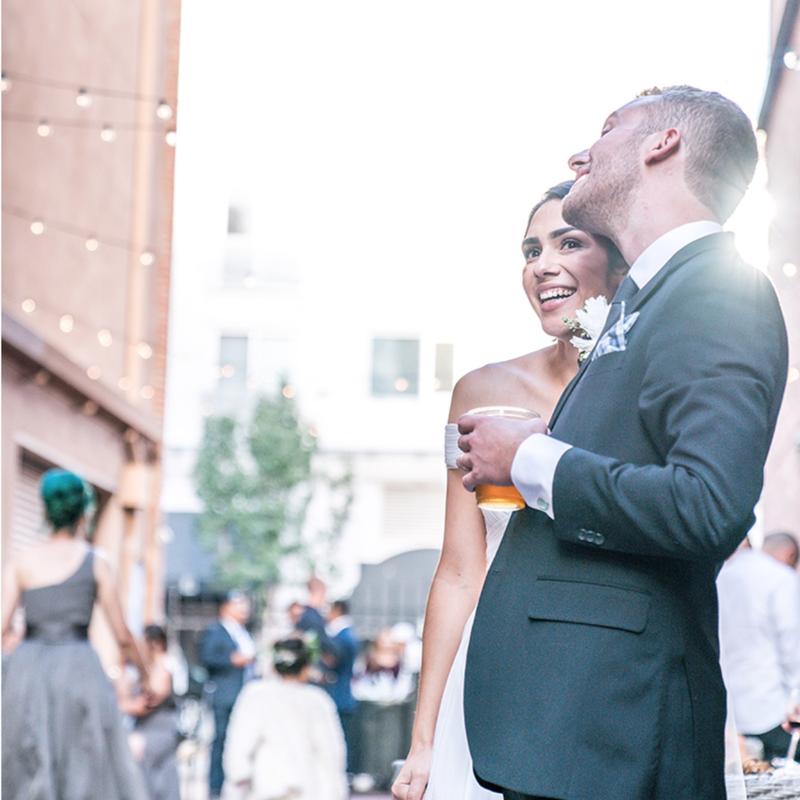 The Marks' wedding capped off a whirlwind of on the go shooting across the western United States. 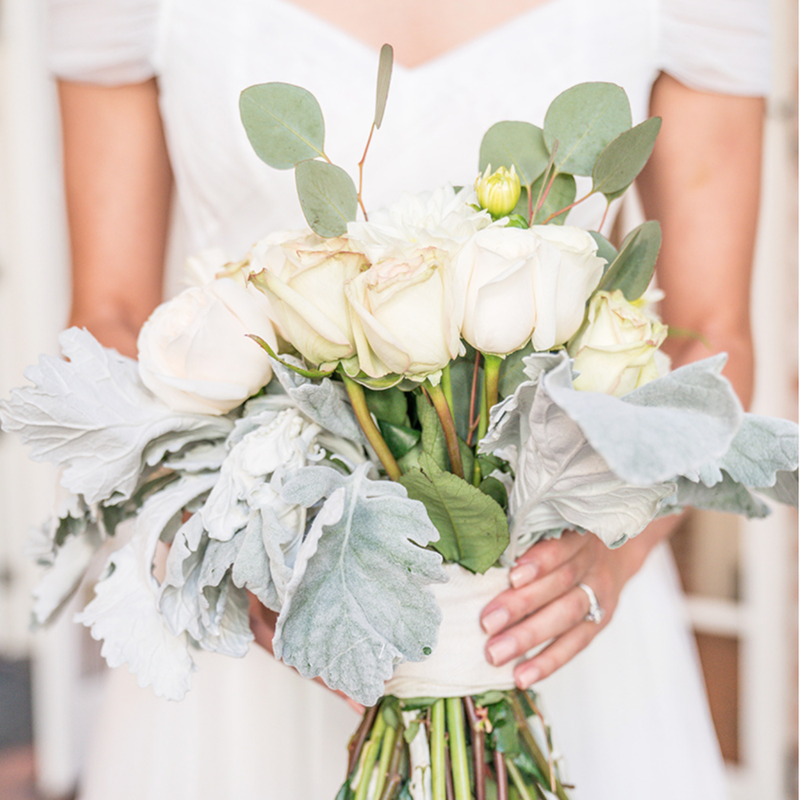 Before that whirlwind we'd met at a coffee shop to see if I was a good fit for their day, get a feel of the wedding, and get to know each other. We talked for an hour about hiking, the pacific northwest, their honeymoon in Seattle and Vancouver, only after that did we get to photos and the wedding day. They were easy going with quiet smiles and sneaked glances at each other every time the conversation circled back to them. Unlike most, photography didn't seem to be a huge concern for them on their wedding day. Not that it wasn't important to capture the memories for looking back on, but the importance of the photos being a true depiction of the day seemed more important than getting the most amazing shot. Michael didn't want a lot of pictures of himself, didn't necessarily want any video, and his reason was the best I'd ever heard. "I want to remember it my way. I don't want to look back and see something and not see it as perfect as I'll remember it." As a photographer, I'm obviously an advocate of capturing moments, but my background is in photojournalism, action, and landscape. I understood Michael's want to capture the scene that's happening rather than create one that might skew the actual moment into something else. I told them what I've been repeating to myself since early high school "My goal with photography is to make people feel what it was like to be there." We ended up decided against a first look before the ceremony, bridal party sessions, and limiting poses to family shots. I'd capture pictures of just Hannah and Michael in motion, and the only bride and groom "session" would be right after the ceremony during a short time for them to be alone. I've always said I love shooting mountains and nature because you can't direct them, nor do you need to as they are already beautiful. The same is true for weddings - we as photographers can be tempted to try and create the visual emotion of a love that's already there. 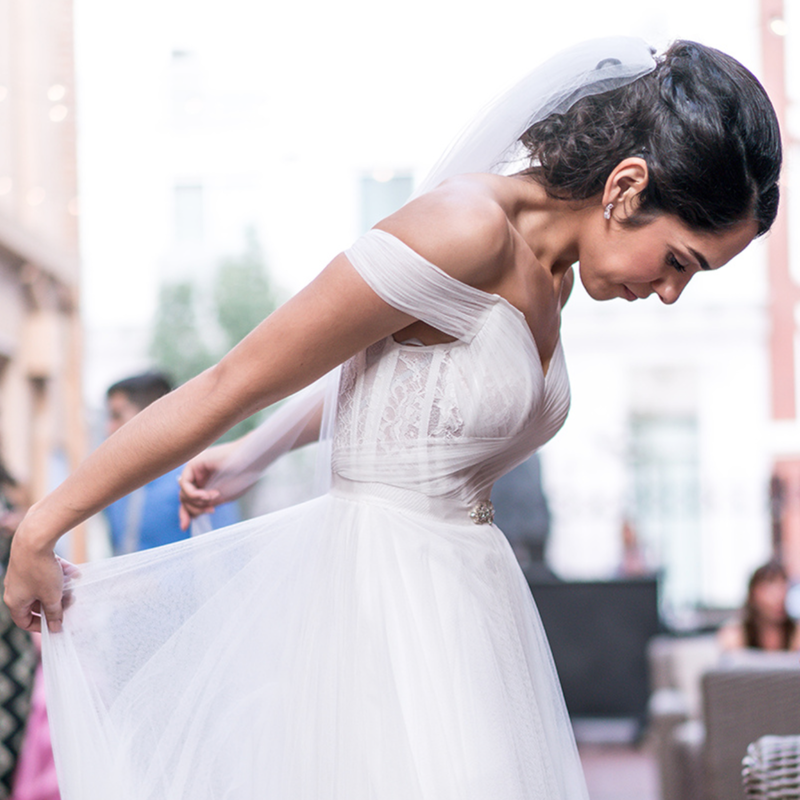 Sometimes it comes beautifully from staged portraits and styling a shot, but I loved having the freedom on this day to capture love in motion, unobstructed from my own influence. Those months after that conversation and coffee flew by. The Marks got ready for their big day, and I traveled on a tour of deserts and mountains through Utah, Colorado, Wyoming, Nevada, and Northern California before returning to San Diego. The weekend was a busy one, shooting both their wedding and Kaboo (a music festival 20 miles north of their wedding), filling up memory cards and strategically backing everything up. It was exciting and new, a rush for me, and a challenge. I loved it. The wedding day ended up fitting Hannah and Michael's personality well. 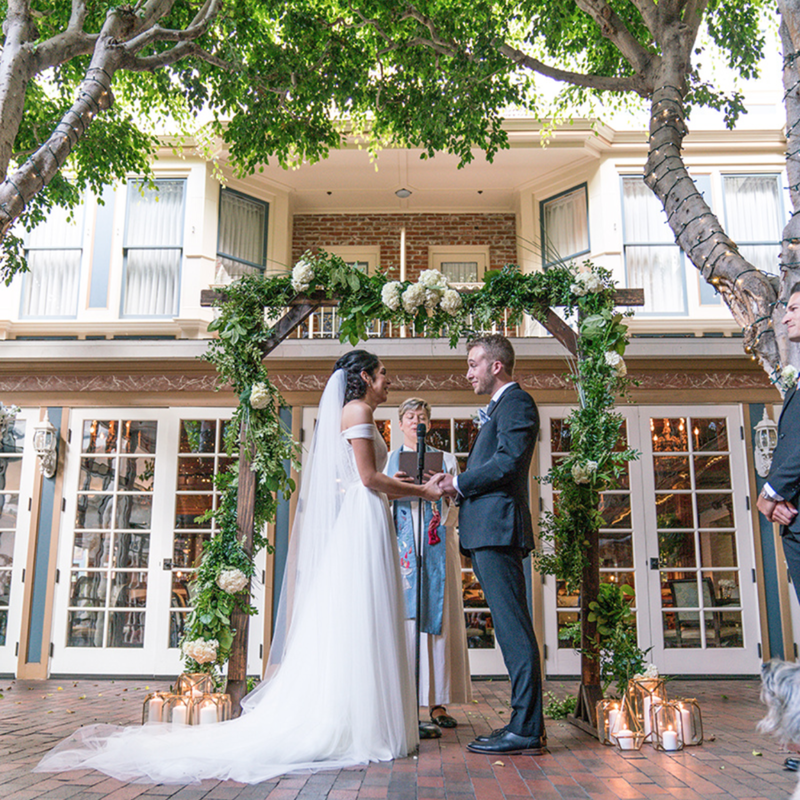 The ceremony took place in the courtyard of The Horton Grand Hotel. It was small, with only close friends and family in attendance, which meant a slower, more relaxed pace. Michael hung out with his best man as Hannah and her bridesmaids got ready. Michael's dog Henry was in attendance, walking by his side down the aisle, watching as they exchanged vows, and had kisses waiting for his newly joined family. Cocktail hour was held in a tall alley strung with lights behind The Horton as the ceremony venue was flipped to the reception, giving the same room two entirely different feels. The sun dipped behind the buildings just before golden hour, creating perfect light. Hannah and Michael made sure I got a beer in between shots before we moved inside for dinner, toasts, and dancing. The rest of the night was a packed dance floor and amazing desserts (this photographers' favorite) capped off with a late night churro man. Some things didn't change from the meeting in the coffee shop with Hannah and Michael. Wedding days can be easy to get caught up in grandeur, raising glasses, talking to everyone, focusing on pictures rather than moments. Their day was amazing too with all the things that make a wedding special, but between the great moments, there were a few nerves along with hundreds of quiet smiles and stolen glances. There's a challenge there as a photographer, to get it as close to the perfection the bride and groom are experiencing. And I hope I was able to come close for Hannah and Michael, to candidly capture what it was to be fully present on one of the most amazing days of your life.